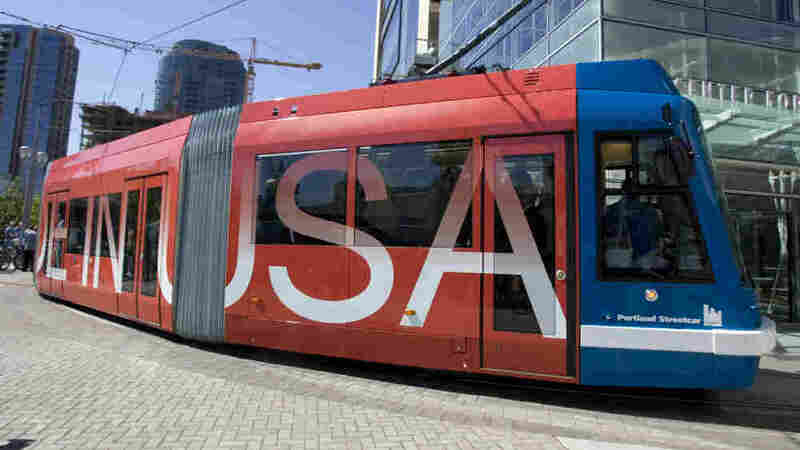 All-American Streetcar Boom Fuels Urban Future It can sound like something out of The Jetsons when President Obama talks about high-speed rail, futuristic airports and nationwide, broadband Internet. One growing part of America's infrastructure, however, has a distinctly 19th-century feel. It's the return of the streetcar. A prototype streetcar made by Oregon Iron Works gets to work in Portland in 2009. President Obama spent the past week talking about his plans to improve America's infrastructure. These speeches sometimes sound like something out of The Jetsons, when the president talks about high-speed rail, futuristic airports and nationwide, broadband Internet. One growing part of America's infrastructure, however, has a distinctly 19th-century feel. It's the return of the streetcar. Like so many urban development stories in America, this one begins in Portland, Ore.
Outside the famous Powell's bookstore, a 21st-century streetcar glides to a stop, opens its doors, and lets out a mix of tourists and locals. Modern streetcars have been running in this city for about a decade, and Chandra Brown lives right along their route. "I love the streetcar," says Brown, who's lived in Portland for 17 years. "They had told me that there were no streetcars built in the United States, and I basically said, 'You're a liar, that can't be, honestly.' So I did some research after that and found out, yes, that was absolutely correct. There was no builder of modern streetcars in the United States." As it happens, Brown is a vice president of Oregon Iron Works. Her company has been making bridges, boats and other heavy equipment since the 1940s. A few years ago, they created a subsidiary called United Streetcar. Now they are manufacturing the first American-built streetcars in more than 50 years. The Oregon Iron Works factory is a cavernous space in a Portland suburb, where men with hammers are busy constructing a streetcar base. Seventy to 90 percent of the parts are made in the U.S.; seats from Michigan, upholstery from North Carolina, windshield wipers from Connecticut. "It was 2009 when we finished the first prototype, made-in-the-USA streetcar," Brown says. "Now this little fledgling company is building 13 cars with $50 million-plus in orders." Those orders are all for cities in the U.S., too. In fact, the U.S. is in a streetcar boom. More than a dozen cities either have them or are actively planning for their development, Oregon Rep. Earl Blumenauer says. "You don't have to be a large, metropolitan area to support it," he says. "Little Kenosha, Wis., has a streetcar. Little Rock has a streetcar." I met Blumenauer in Washington, D.C., at a coffee shop on H Street Northeast. This is a gradually gentrifying neighborhood that is Stage 1 in Washington's planned streetcar route. "What the skeptics, I think, forget, is that virtually every American city was designed around a streetcar," Blumenauer says. "I mean, the most ambitious plans for Washington, D.C., are approximately one-fifth of what the District had 100 years ago." Blumenauer was a champion of streetcars years before his state started manufacturing them. He says they're green, they last decades, and businesses are more likely to set up shop along a streetcar route because they know it won't move the way a bus line might. "So reintroducing the streetcar is actually back to the future," he says, "and this is what this community was about when it was coming together a century ago." Critics of the streetcar craze say the mania is part of the problem. Brian Taylor directs UCLA's Institute of Transportation Studies and says governors, mayors and taxpayers all want flashy new projects, but sometimes those are not the best solutions. "We're painting ourselves into a bizarre corner where we're not able to maintain our streets, we're not able to maintain the buses and the trains that we have out there, and we're focused on cutting ribbons in front of new rail projects," Taylor says. He's skeptical that streetcars are the urban transit solution they're touted to be. "If the investment is tied in effectively to the rest of the transit system, it can be a very effective investment," he says. "If it's not — and there are cases where it has not been — then it's not." On Monday, President Obama will unveil his new budget. He has already said it will call for rebuilding American infrastructure. That means more planes, trains, automobiles — and perhaps also streetcars.